Dad On the Run: Drill me, Baby! Leaving the house with no kids in tow is such a rarity these days that even going to the dentist can seem like one of those work half-days I used to get once in a blue-moon. This morning I headed off to have my teeth scraped on and my gag reflex tested (they call it a cleaning), which is an experience I used to despise. Even the part spent on the chair isn't that bad considering I'm resting my bones and no one is asking me for anything more complex than "open wider" or "look this way." Now, when including the commute on the train with earphones in and my FB app buzzing, I thoroughly enjoy a dental appointment. The commute was more interesting than usual because I was on a train car that was covered from top to bottom with stickers simulating a sunny FLA landscape. Apparently, it was an ad promoting FLA vacations; quite ingenious if you ask me. It was odd seeing all those grumpy Chicago commuters surrounded by palm trees, blue skies and water fowl. Don't you people know you could be home getting screamed at and/or puked on right now? Smile at your handheld personal computer or better yet each other, it's a beautiful day! 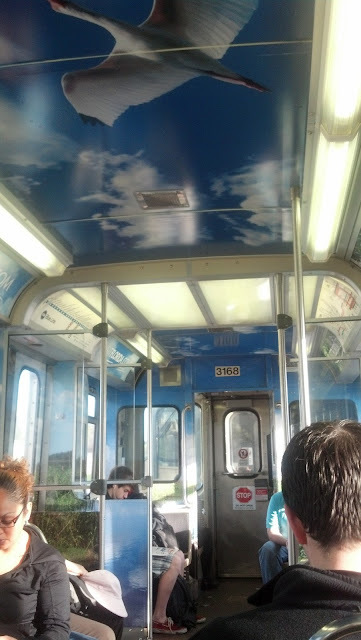 My CTA car was made out to look like a sunny FLA horizon, but everyone acted oblivious. I actually wished (just for a second) that J Bean was with me because she would have flipped! When did we get too old and too cool to care about the interesting and out of the ordinary? Coincidentally, though certainly not impeding my dental hygiene fun, the dentist was approaching 9 months pregnant. I have to admit, it was an odd sensation to be so close to an expectant mother's belly that wasn't my wife's. With the belly next to my head I felt that every word I said was being heard by the passenger who kicked me in the ear a few times. "Nice try, runt," I mumbled under my breath while some implement was buzzing in my mouth, "this is still my day and it'll take a more ferocious assault to dampen my spirits. Hell, you don't even know how to whine yet. You scare me not." Honestly, the pregnancy status of my Doc allowed me a little schadenfreude knowing the one usually in charge of my mouth torture will soon be experiencing meconium poop for the first time (which is really something you know nothing about until you have seen it with your own eyes). My cleaning was completed 20 minutes before Vv and the kids were scheduled to pick me up so we could all take her to work and then go run a few errands. it was a quick and painless cleaning, not a single cavity, dammit! Totally missed the opportunity for a follow-up appointment; rookie move on my part. Since I had some free time, I half walked half skipped to the corner coffee house and had myself a large Americano and enjoyed some more music on the way back to the extraction point. The whole family showed up and we went about our day. The cherry on top is a Dad's night out tonight and I'm getting relieved before bedtime! Sometimes when you're a stay home parent, the weekend falls on a Tuesday and it's just as sweet as any three-day holiday if you ask me. Don't forget to have yourself some "you time" and splurge on a dental procedure or a visit to the urologist for a check up soon... you deserve it. Come on over to my office if you want a little dadblogger trash-talking with your tooth scraping.